Growing tomatoes in raised beds is one of the easiest and practical approaches to gardening. You don’t need to be a master builder or even handy with tools in order to set up raised beds, either. Drainage. Beds are set higher. Water drains out more easily. Yield. In a raised bed, you can grow your plants closer together, producing more tomatoes for your space. Convenience. Higher beds mean you don’t have to bend over as much to work the soil. You can even build elevated beds that make it easy to work on beds if you find it especially difficult to lean over. Check out these Garden Rack plans. Soil quality. Adding compost, top soil, and fertilizers to the garden bed (not the paths) mean a nutrient-rich home for your tomatoes. This saves resources and concentrates them where they will be best used. You’ll also walk on paths between beds and prevent garden soil from becoming compacted. Plant health. If a fungus or other disease overtakes your tomatoes, you can replace the soil in the following year – a step that would be impractical and cost-prohibitive in a regular garden. Pest prevention. Slugs find it harder to infest tomato plants grown in raised beds. Neatness. Raised beds are contained areas which are easy to maintain. 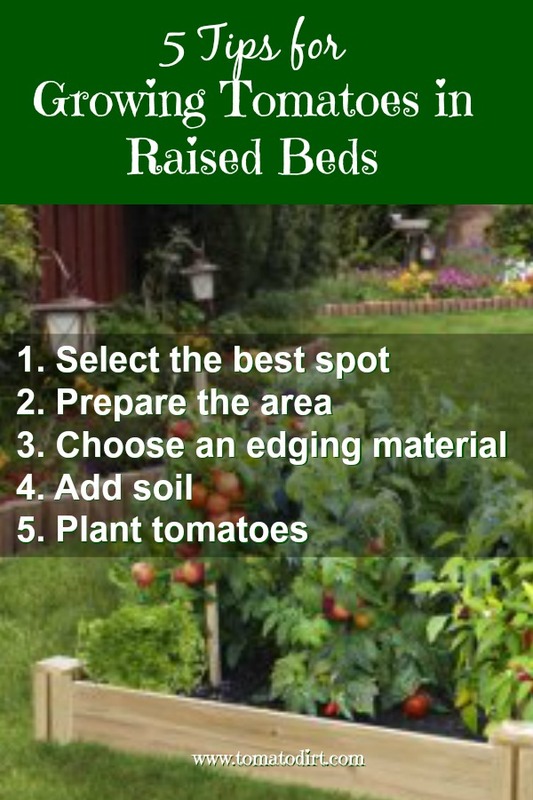 The best raised bed sites for tomatoes are level, well-draining, and close to a water source. Choose a spot that receives at least eight hours of direct sun daily. Create an outline of your raised bed with string, garden hose, or even flour. Measure the area. Then work the soil. Tomatoes are deep drinkers. Roots of plants in a raised bed will need to penetrate the soil below. Most vegetables grow beautifully in 12-inch deep beds, but deeper is better with tomatoes. Prepare the site by removing sod. Use a tiller, spade, or pitchfork to turn and loosen the soil at least 12 inches deep. How wide should I make my raised bed? After you install the edging material, line the bottom of the raised bed with chicken wire or hardware cloth to keep out gophers, moles, and other tunneling pests. To determine the volume of soil needed to check your raised bed, measure its length, width, and height in feet and multiply those numbers together. The result will be the number of required cubic feet. Combine top soil and organic matter (shredded leaves, compost, well-rotted manure, kelp) in the raised bed. Use a spade to mix components well. Rake the surface smoothly. Follow regular tomato planting steps.